Reginald Harold Down (also recorded in some sources as Harold Reginald Down) was born in Yeovil in 1897, the eldest of the five sons of Yeovil Quantity Surveyor William Reginald Down (b 1871) and Mary née Hitchcock (b 1871). I was unable to find the family in the 1901 census, but around 1900 the family moved to Hampshire where the three youngest sons were born, one at Hartley Wintney and two at Tunworth. By 1911 the William and Mary had moved yet again and the census listed them living at Mount Road, Upper Penn, Staffordshire, with their sons; 13-year old Harold Reginald (in this instance), William Arthur (b 1898), Cyril Robert (b 1900), Archibald Stanley (b 1904) and Leslie Claude (b 1906). Reginald enlisted on 1 November 1916 at Birmingham, giving his address as 6 Merridale Road, Wolverhampton. He became a Private (Service No 9810) initially in the 22nd Battalion, Royal Fusiliers. The remains of his Attestation papers, reproduced below, give an insight into Reginald as a person and also highlights important dates in his service history. Prior to enlistment he was employed as an Auctioneer's Clerk. His Medical History page shows Reginald to have been quite short at 5' 4" (1.626m) and slightly built at 119 lb (54 kg) although his physical development was classed as 'good' with a fully expanded chest measurement of 35" (0.89m). The medical form states that Reginald had a 'slight inequality of two sides' (of what we don't know) but in pencil underneath is written 'Fit for Service in the Field'. Reginald was a qualified 'Special Bomber', and he embarked on 3 August 1916 joining the 9th Battalion in the field on 15 August 1916, being transferred from the 22nd Battalion. He was sent on a Signalling course on 20 May 1917 and returned to his unit in the field on 30 June 1917. He went on leave on 30 August. The paper notes that Reginald was 'Accidentally killed' in the field - presumably a euphemism for 'Killed in Action' which is stamped below the written entry. The date of his death is not clear, but it was 25 November 1917 during the Battle of Cambrai. He was 20. The Battle of Cambrai (20 November – 7 December 1917) was a British campaign of the latter stages of the Great War. Cambrai, in Nord-Pas-de-Calais, was a key supply point for part of the German Hindenburg Line. The British operation was to include an experimental artillery action and the commander of the British Third Army decided to incorporate British tanks into the attack. The battle is often erroneously noted for being the first mass use of tanks in a combined arms operation. However, the French had deployed large numbers of tanks in April (130+), May (48) and October (92) 1917 and the British more than 200 in Flanders in June and July. Despite the initial success of the Mark IV tanks at Cambrai, German artillery and infantry defences exposed the frailties of their armour and the vehicles became mostly ineffective after the first day. The battle was largely an artillery-infantry engagement that achieved surprise and technical superiority against strong fortifications but weak German infantry and artillery defences, which were quickly reinforced. The British attack demonstrated that the Hindenburg Line could be penetrated and showed the value of new artillery and infantry methods, such as sound ranging and infiltration tactics that would later play a vital part during the Hundred Days Offensive. 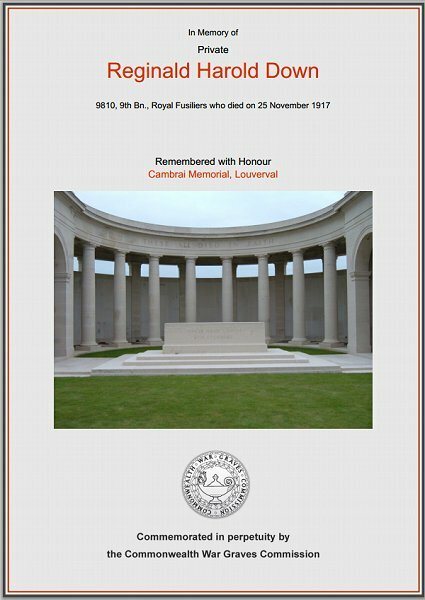 Reginald is commemorated on Panels 3 and 4 of the Cambrai Memorial, Louverval, Nord Pas de Calais, France. His name was added to the War Memorial in the Borough in 2018. The Commonwealth War Graves Commission certificate in memory of Reginald Down.